What would Charlotte think, I wonder, if she knew people were not only still reading her masterpiece nearly 200 years after she was born, but enshrining it in an international publishing house vintage logo on coffee mugs? 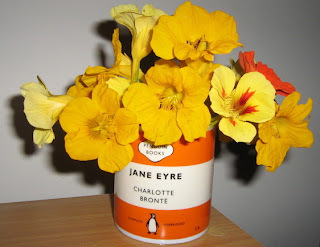 There is something oddly satisfying about the combination of Charlotte's immortality with the fragility and mutability of flowers that'll be dead in a couple of days -- but will come back next and every Spring, with, bless them, no help from me apart from the odd caterpillar massacre. Also, the yellows and oranges are nice, don't you think? And I do love that stripy one. I've been coveting those mugs. Also the nasturtiums are fabulous. There's a clump of them growing on the verge down my street, but I'm thinking that I really ought to have some in my overgrown backyard too. orange is a difficult colour to paint with. "Though modest quiet was expected of ladies, Charlotte could not contain the upsurge of language any more than she could deny her thought. Some of her most formative letters - letters in which we hear for the first time her complex authorial voice - were written to men who would not grant what she wished. When Charlotte sent the Poet Laureate, Robert Southey, some of her poems, he told her in 1837 that "Literature cannot be the business of a woman's life''. She replied with apparent propriety which completely reassured Southey, but her letter reverberates with veiled sarcasm which the editor of this volume does not hear: "In the evenings, I confess, I do think, but I never trouble any one else with my thoughts... I trust I shall never more feel ambitious to see my name in print; if the wish should rise, I'll look at Southey's letter, and suppress it.'' The brilliant verbal glide of her abjection to Southey was her first public performance of a role she made her own - hiding undaunted creative fire under a mask of perfect docility." Funny, I've not seen Southey's name on one of those mugs. Brilliant woman. Brilliant flowers. Villette was my favourite. Lucy Snowe. Wonderful Lucy Snowe. Funny you should say that Casey, I've never heard of him. I do love Charlotte though. I bought one of the teatowels when I was away - tried to resist, but the thought 'that will travel well' just kept thinking itself. Couldn't decide which one I wanted the most, but in the end went for A Room of One's Own. I've tacked it onto the door of my 'study'. When I was a child in Adders I used to eat nasturtium leaves wrapped around some Kraft cheese (OK, so our food habits were unsophisticated.) I've tried it with cheddar in Melbourne but the nasturtiums don't taste the same. A room of one's own, $50,000 per annum, and someone to dry the teacups (as I cannot summon-up an image of Virginia doing so) ! 2. thanks for that Casey. One has to get hold of original orange Nasturtium to find edible flavour in the leaves. Best bet is to visit someone with a patch that has been going for 30 years or so and therefore isn't a modern hybrid. Also, the unripe seed when pickled is a great alternative to capers. Those bright orange flowers(along with dahlias, poppies, scented stocks, snowbells and violets)always remind me of my grandmother. These are beautiful. The yellow and orange are just gorgeous, as well as the stripy one. I've forgotten about nasturtiums—I have an alien looking 'drought resistant garden', must put some flowering things in, it's all leaves, grasses and succulents, and an odd struggling rose. Looking at the mug, though, I can't help thinking more of Penguin Books, and less of Charlotte, somehow. Their trademark merchandise has now popped up everywhere in Melbourne (at least 'in all good bookstores', such as Readings). The new paperback editions are wonderful, I'm somehow less keen on the accessories. Sorry. But then, I work in publishing, and tend to notice logos and branding before I even look at a book ... Back to the arrangement: it really is lovely. I always look forward to the poppies too, for their wonderful brightness, at around this time of the year.